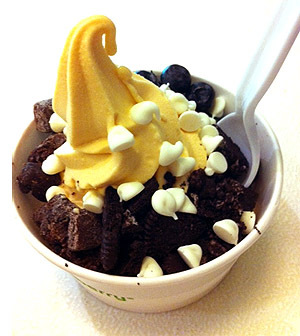 Have you been to your local Pinkberry Yogurt Shop yet? Or to any other yogurt shop at all? If you don't know, Pinkberry has become one of the most successful yogurt shops around the country in less than 5 years. Because I design yogurt shops, I decided to investigate what made this particular store so successful. If you are interested in learning what I found out, please read below. In our Green News corner, learn about the new Green Wall concept which is easy to take care of. Pinkberry’s success is not an overnight success story. 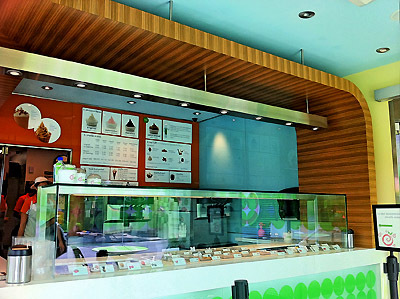 Over 100 frozen yogurt shops have opened around the world in just 5 years! A perfect match between a restaurant owner and an architect created a unique concept which really took off. So what was it that really lifted the business off the ground so fast? Here are 5 main reasons that I personally found from a few sources. If you missed our last newsletter on The Latest Interior Design Trends of 2012, look HERE. Shelly Hwang was working on her Tea Room idea when she hired her future partner Young Lee to be a designer. When the Tea Room concept failed, for multiple reasons, the two decided to try a completely different and new concept – Healthy Yogurt Shop. The original Tea Room space was too small and the local Building Department did not allow any room for seating outside. A yogurt shop did not need that much seating or space. 2. The New Yogurt is Healthy! Instead of trying to make their yogurt taste good by using more sugar or fat, the owners took a different approach looking at what is being done overseas. “I got the idea for this kind of yogurt when I visited Vienna in 1993 and first tasted a specific kind of soft serve gelato-like yogurt…” said Lee. Shelly, who is also a cook, refined the taste of the yogurt to perfection by experimenting. 3. Keep The Concept Simple! The main idea is to concentrate on only a few flavors of yogurt instead of having a variety of different products. Simplicity is the real key here which allows more time for mastering your product’s uniqueness. Pinkberry has only 3 to 6 main flavors, depending on the season. They also provide fewer toppings, which are carefully selected to be fresh and healthy. The interior design is a great reflection of the essence of your business. 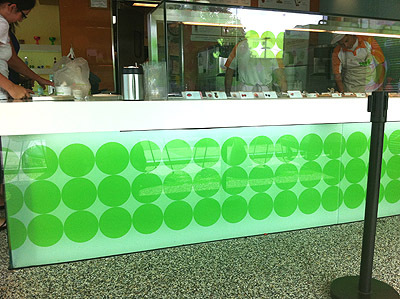 For Pinkberry, trying to convince even the landlord was tough, but in the end the results were obvious. “I would tell them my design ideas, which included $600 tables, $350 chairs and a $1,200 bench. I wanted to use an expensive build-out that made everything reflective. They thought we were crazy to spend that kind of money when the average yogurt ticket was only $6,” said Lee, the architect of Pinkberry. You don’t want to look like an amateur to your clients when you are creating a new concept. 5. Have Fun With Design! 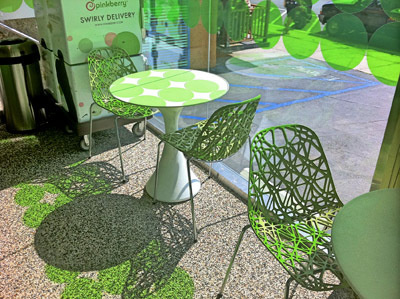 Pinkberry has a pebble floor which reminds us of a hot summer day at the beach when you can’t wait to get ice cream! Lee specified Philippe Starck’s Victoria Ghost chairs and a George Nelson-inspired bench. “Scandinavian designs give the place a retro-modern look with green circle dots to evoke Danish butter and dairy products.” Le Klint lamps look like yogurt swirls. 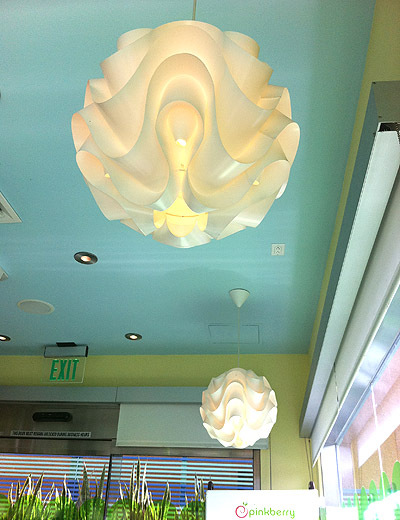 All the pictures were taken by Mindful Design at the local San Diego Pinkberry location. See more images HERE. Are you thinking about making architectural changes in your business? Contact us HERE! 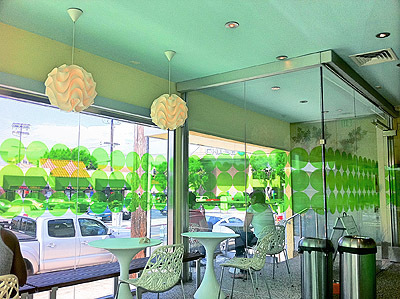 Take a look at other yogurt shop designs including 2 yogurt shops designed by Mindful Design Consulting HERE. 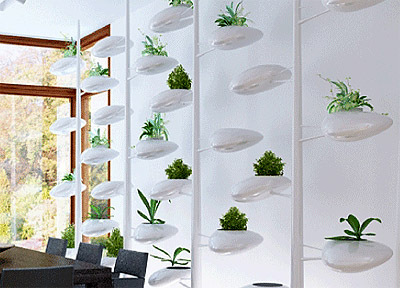 Vertical gardens or green walls have become a very popular way to bring nature into any interior. It looks fantastic but the energy and the cost of upkeep on the plants may leave skeptics out of this design feature. The Live Screen tries to address this issue with this green wall. Learn more about this unique product HERE.